The "mop-up" design of this submersible pump removes water down to 1/12" and features a special diaphragm valve to prevent water back-flow. The BJM Pumps R400D Submersible Water Pump features a rubber-clad bottom to protect floors from damage. 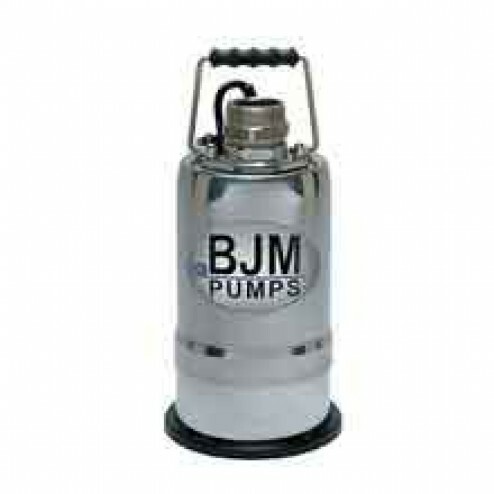 Perfect for easy clean up of spills or flooding in the basement at home or on the job. Maximum Output Capacity: 50 GPM. Motor Specifications: 1/2 hp, single-phase, 3450 RPM. Power Requirements: 115V, 60 hz. Two mechanical seals protect the motor, another protects the impeller. Impeller made from fiberglass-reinforced Noryl plastic. 33" long power cord included. Pumps water out down to 1/12". 304 Stainless Steel housing outperforms standard aluminum housings. Top discharge design helps cool motor. NEMA Class F insulation allows motor to heat up to 230 degrees F without meltdown. Safety feature automatically turns pump off when temperature or amperage is too high, turns back on when motor cools back down.